The Far Cry series has always done guns better than the average shooter. It’s not just the selection, but the feel and mechanical love that goes into each one. They’ve all got lovely little notches cut out from years of use, solid kick-back, and a sense of presence that really sells the open-season experience. 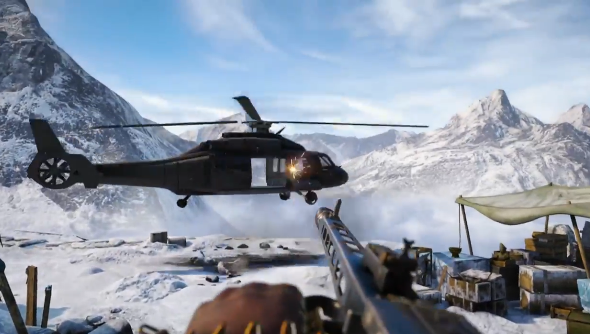 Far Cry 4 doesn’t look like it’s bucking the trend anytime soon. This new trailer shows off some of the game’s guns and other death-dealers that will soon be available for hire. It does look like we’re getting a few repeats from our last outing, with the Vector and the flamethrower looking to be almost exactly the same. Others are less familiar though, with the mental MG42 and the beautifully silent auto crossbow looking plenty of fun. The absurdities of Far Cry’s violence is certainly captured in the trailer, with a bouncy soundtrack playing as meat is used to bait a tiger into attacking people. Far Cry 4 releases November 18th. I cant wait to ride an elephant-mounted mortar into battle.